In September 1867, while honeymooning in Tyrol, Ernst Haeckel took a brief leave from his new bride to scale the 2,700-meter (8,860-foot) Tristenspitze. His guide was inexperienced and the weather was nasty. When night fell, the two men were still on the mountain, completely lost. Expecting to die, Haeckel wrote a hasty will, asking that he be cremated and his ashes placed in the grave of his wife. He didn't mean the wife to whom he was writing the instructions, but his first wife, who had died three years earlier. The storm subsided, Haeckel survived, and he probably never showed his new bride, Agnes, the will. But the episode didn't bode well. He never much enjoyed his second marriage, and one gets the feeling it was no picnic for Agnes, either. 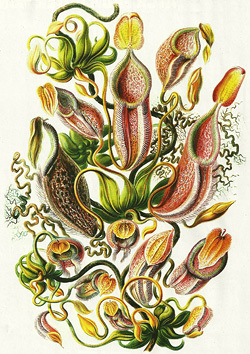 Haeckel was born in 1834 to a family of some distinction. He studied medicine at the universities of Würzburg and Berlin, but soon realized he hated disease too much to be a good doctor. When he opened a medical practice in Berlin, it was only a formality. The young man then embarked on a lengthy trip to Italy, financed by his father, where he toyed with the idea of becoming a landscape painter. By then, Dad had lost patience, and Haeckel abandoned that fancy and turned to science. Besides he was in love. The object of Haeckel's affection was his cousin, Anna Sethe. After his flirtation with a bohemian lifestyle, he returned to Germany and toiled long hours for a university appointment to prove himself a worthy provider for her. For 18 months, Ernst and Anna were happily married, but she suddenly fell ill and died, perhaps from appendicitis. In the aftermath of his wife's death, Haeckel traveled to the town of Nice in the Mediterranean, and found himself transfixed for "several happy hours" by a jellyfish in a rock pool. He called the animal Mitrocoma annae meaning "Anna's headband." Anna's death remained an open wound for the duration of Haeckel's life. He was never a particularly religious man, but by his own account, religion became a complete farce in his eyes after he lost Anna. To give himself a reason to continue living, Haeckel devoted himself to advancing the case for evolution, but while Darwin tried to avoid ugly arguments with religious believers, Haeckel was pugnacious and, in the eyes of biographer Robert Richards, contributed to a breach between science and religion that persists today. In the year after Anna's death, he produced a 1,000-page, two-volume work, Generelle Morphologie der Organismen , described as "too sulphurous even for Thomas Henry Huxley," and Huxley himself became known as "Darwin's bulldog." Besides absorbing work, Haeckel also sought comfort in a new bride, but his second marriage was impulsive and ill-advised. Part of what made the union so unhappy was that his confrontational style brought his new family hate mail and even death threats. But in making enemies, he also made converts to the cause of Darwinism. In fact, Haeckel's books and lectures may have influenced more people than Darwin's own works, selling more copies and getting translated into more languages. Haeckel first read Darwin's Origin of Species while studying radiolaria — single-celled marine organisms with silica skeletons. 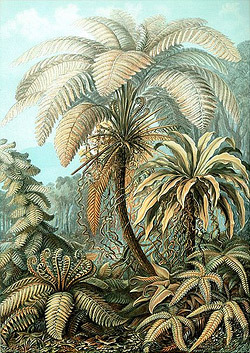 In the years that followed, Haeckel went on to study other organisms, identifying thousands of new species, and establishing the Kingdom Protista. (No longer in use, Kingdom Protista included microorganisms that fit into neither animal nor plant kingdoms.) And for decades, he marveled at medusae (cnidarians, including jellyfish), naming especially attractive specimens after the women he treasured most (second wife Agnes not included). 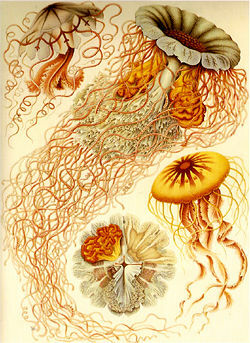 Haeckel's science has often been criticized as too speculative, but he sometimes speculated pretty accurately about the history of marine organisms. The Cambrian Period, roughly 545 to 505 million years ago, marked a dramatic diversification of life forms found in the fossil record, yet the fossil record is pretty sparse before that time. In the 1870s, Haeckel asserted that Precambrian life forms had been tiny — roughly the same size as modern embryos. Modern finds of Precambrian fossils suggest that he was right. Haeckel was familiar with the size of embryos because he was a pioneer in the field, carrying out difficult dissections and laying the groundwork for future studies. He also championed the notion of "ontogeny recapitulates phylogeny," in other words the development of an individual shows the evolutionary history of its species. He compared embryos of various vertebrate species to support this argument, but he exaggerated the similarity of the embryos in their early stages. Some of his contemporaries, Wilhelm His among them, accused him of distorting his images. In fairness to Haeckel, however, dissecting, observing and portraying embryos were tough tasks in the 19th century, when scientists had to work with relatively primitive equipment. Moreover, he followed a practice of portraying idealized "types" of organisms rather than producing faithful representations of specific individuals. Scientists argued over which approach was better, and this dispute influenced criticism of his work. The years have been kinder to the more restrained hypothesis of Karl Ernst von Baer, who argued that different species' embryos look more alike than do the adults. In fact, embryos of different species pass through a development stage in which they look more alike than at earlier or later stages. Research published in 2010 found that the genes expressed at this particular stage evolved far earlier than the genes expressed at other stages in embryonic development. So although ontogeny doesn't recapitulate phylogeny, the processes do exhibit links to each other, and the Nature issue including the 2010 bore one of Haeckel's embryo pictures on its cover. 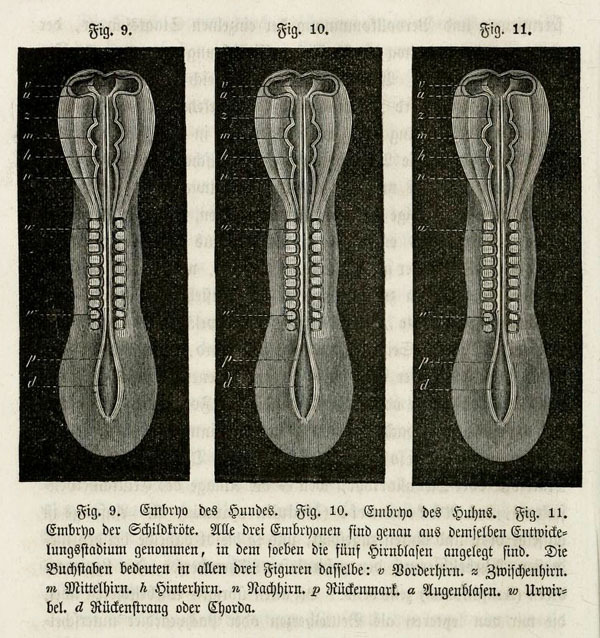 The same woodcut reprinted for a dog, chick and turtle embryo (top), and a reproduction of Haeckel's embryos in a book by George John Romanes in 1892 (bottom). From "Copying Pictures, Evidencing Evolution" by Nick Hopwood in Public Domain Review . Haeckel's enthusiasm for recapitulation likely reached its lowest point in the first edition of Natürliche Schöpfungsgeschichte ("History of Creation") when he showed woodcuts of the early stages of dog, chicken and turtle embryos, defying the reader to detect a difference. Detecting any difference was impossible. The printer used the same woodcut three times. 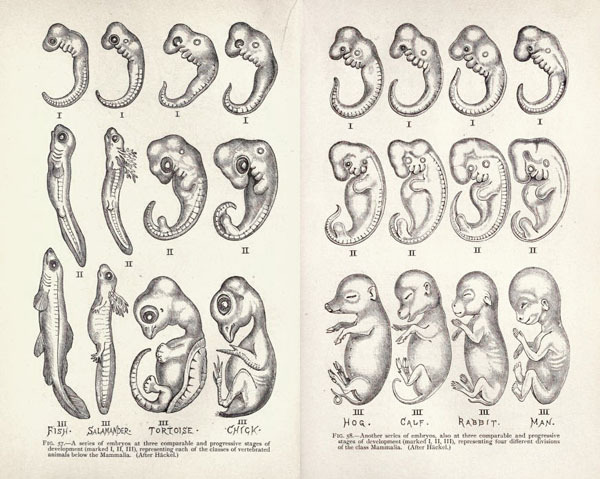 In fact, the actual embryos were remarkably similar at that stage, but the woodcut blunder followed Haeckel for decades. Haeckel also turned his attention to human evolution, and he argued that the process consisted of precisely 22 phases, each better than the last, and the 21st — the "missing link" — being a halfway step between apes and humans. He even formally named this missing link Pithecanthropus alalus, translated as "ape man without speech." Haeckel disagreed with Charles Darwin about the birthplace of our species, believing Southeast Asia was a better bet than Africa. (The missing link was what the Dutchman Eugène Dubois, discoverer of Homo erectus, would later resolve to find in Indonesia.) Zoologists have revised the rules since Haeckel's time, prohibiting the naming of a species that no one has yet found. While modern-day creationists delight in Haeckel's woodcut goof, and modern biologists suspect that he guessed a little too much about human evolution, many more modern readers must recoil at his views of race. He hypothesized that humans comprised multiple species, perhaps evolved from an ancestor who had lived on a now submerged continent called Lemuria. In 1881, he visited Ceylon (now Sri Lanka), partly to search for marine specimens, and partly to study the people. He believed Ceylon was near his hypothetical sunken continent. The population was ethnically diverse, and Haeckel made comparisons. He regarded the indigenous people, known as the Veddas, as irredeemable savages. He admired the "genuine child of nature" beauty of the Hindu Tamils while lamenting that their good looks suggested "much more than the brain within fulfills." Haeckel expected — and wasn't very upset by the idea — that the "superior" Germanic peoples would eventually drive out the "inferior" groups. He also gauged the intellectual abilities of contemporary Papuans, "Hottentots" and Aboriginal Australians as below those of horses, elephants and dogs. Looking at the title page of the 1868 edition of Natürliche Schöpfungsgeschichte, which showed a diagram of human races and various apes, even Charles Lyell thought the Africans looked too simian. Embarrassed, Haeckel agreed. 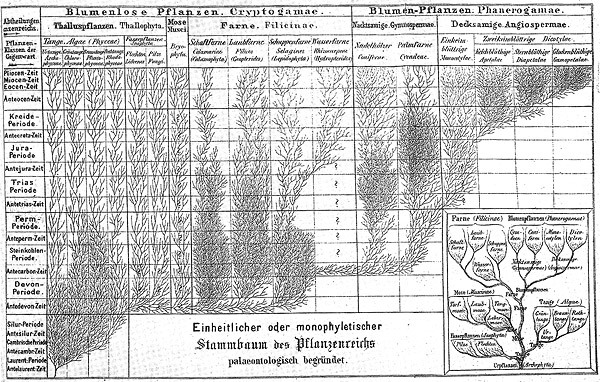 An effective popularizer of science, Haeckel produced numerous tree diagrams, showing evolutionary relationships between different species. Modern scientists and science historians have differed on the value of these diagrams. Stephen Jay Gould complained that Haeckel's vertebrate evolution downplayed seemingly unimportant organisms, such as fish, even though fish remain the most diverse of all vertebrates. Other science historians have praised Haeckel's work. Whatever the case, the tree diagrams included humans. Over the years, Haeckel published human tree diagrams showing the relative positions of what he saw as different human species. Not surprisingly, Germanic Caucasians ranked up there at the top. What might surprise those who link Haeckel to 20th-century fascism was that Jews ranked at the top, too. Haeckel had Jewish friends, though he was given to occasional anti-Semitic remarks. Regarding other groups, Haeckel's views about race (or what he saw as separate human species) proved malleable. Early on, Native Americans ranked near the top, well ahead of Asians. Haeckel might have been swayed by Romantic literature about "noble savages." If so, he might have been subsequently swayed by Buffalo Bill's traveling Wild West Show, in which mean Indians were repeatedly walloped by white settlers. Or he might have been influenced by the fact that his books were being translated into Japanese. Either way, later stem trees placed Asians well ahead of the once-noble American savages. Although "lower species" of humans moved around, Caucasians stayed at the top, and Germans were best of all. In 1936, Nazi racial hygienist Heinz Brücher published a book praising Haeckel's views about racial hierarchy. What vouched for Haeckel's authority was not just his work, but his family's impressive Nordic pedigree. Brücher's book included a 5-foot chart of Haeckel's family history. How racist was Haeckel? Given the age and culture in which he lived, he probably wasn't much worse than his contemporaries. But because he was a prolific author and science popularizer, he was influential, and this crystallized his views for an age that now finds them pretty repugnant. In Haeckel's defense, anthropologists continued to argue whether human races comprised a single species well after the turn of the 20th century. But essayist Bernd Brunner opines that Haeckel can't be absolved of all responsibility for the ideas he entertained or, more significantly, wrote down and published. He did, after all, want to persuade others. Despite racial views that would wrench a modern stomach, Haeckel might have been surprised at his posthumous enlistment to the Nazi cause. After all, his contemporary Rudolf Virchow had linked him to socialism. And Haeckel's own observations didn't always comfort the wealthy and powerful; with wry amusement, he wondered about the reaction of Europe's upper crust to the fact that embryos were so similar, not just between rich and poor people, but between people and dogs. Philosophically, Haeckel considered himself a monist. In the words of science historian Mario Di Gregorio, it was "a unity he believed to underlie the superficial diversity of all things." While Haeckel sometimes joked that modern science had demoted the deity to a "gaseous vertebrate," his views were perhaps more in line with pantheism. As Di Gregorio puts it, "No dualism, no divine creation, no afterlife, just the eternal existence of force and matter in incessant change." Haeckel was complicated. He generally opposed war, hating situations where revolvers trumped brains and, though he criticized religion for offering too much sappy compassion to the weak and undeserving, he pointed out that human compassion arose "millennia before Christ." The potential for compassion without religion was probably among the many statements of Haeckel's that riled believers. He even sparred with believing evolutionists, including the entomologist Erich Wasmann, a talented scientist whose work is still cited today. Wasmann was a Jesuit, and Haeckel had particular suspicion of that religious order, seeing shadowy Jesuit figures skulking everywhere, even among Protestants. For its part, the Church never much liked Haeckel. After he delivered a popular lecture in Rome, a journalist recorded, the pope ordered a "divine fumigation." In between dissections and arguments, Haeckel produced artwork, much of it quite beautiful, starting with his atlas of radiolarians, published in 1862. It has been argued that what Haeckel "saw" was influenced by Jugendstil, the Art Nouveau form popular in Germany at the time. 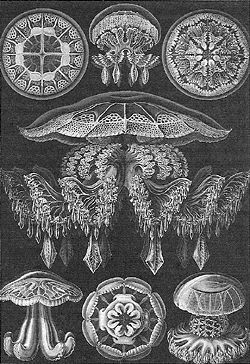 In Haeckel's view, common ancestry helped explain the repeated patterns in nature, from the shapes of leaves to the body plans of cnidarians. He illustrated all of them in his unmistakable style. Whether or not artistic style influenced Haeckel's illustrations, his illustrations certainly influenced later art forms, including light fixtures, jewelry, furniture, and even a gateway to the Paris World Fair in 1900. When he had a house constructed in Jena, he named it Villa Medusa and decorated it accordingly, all the way down to the cnidarian-like lights. 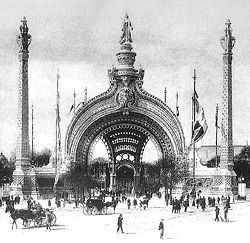 His work inspired Louis Comfort Tiffany, Antoni Gaudí and René Binet. Later in his career, Haeckel produced Art Forms in Nature , a work that he published in a series of 10 installments. Designed to interest the general public in naturalism, the installments included Haeckel's own illustrations of animals, plants and microscopic organisms. Paleontologist and science historian J. David Archibald likens Haeckel to John Audubon in the United States and John and Elizabeth Gould in England for his combination of artistic ability and scientific knowledge, though Haeckel "saw no problems couching racist views under the aegis of science." In 1913, he published a set of photographs titled Nature as an Artist , aimed at countering accusations that his illustrations could be misleading. Today, however, many scientists and science historians share the conviction that his images were often highly contrived, beautiful as they may be. When Haeckel worked on the artistic popular books around the turn of the 20th century, he enjoyed the advice and encouragement of a new friend, Frida von Uslar-Gleichen. Their partnership began when she sent him a fan letter. Frida was a 30-something spinster of somewhat modest means, but she was educated and beautiful and — not insignificantly to Haeckel — had been born the same year his beloved Anna died. Although in his 60s, Haeckel was still an attractive man. The relationship moved beyond the platonic, and considerably brightened Haeckel's twilight years. But Frida suffered health problems, as well as despair over their inability to break with Victorian convention and become a couple. She died of a morphine overdose, maybe intentional, and Haeckel memorialized her with the species name of a newly discovered cnidarian.